The Wells Branch Neighborhood Association and the Garden Guild are sponsoring a yard landscaping contest for the Spring of 2019. 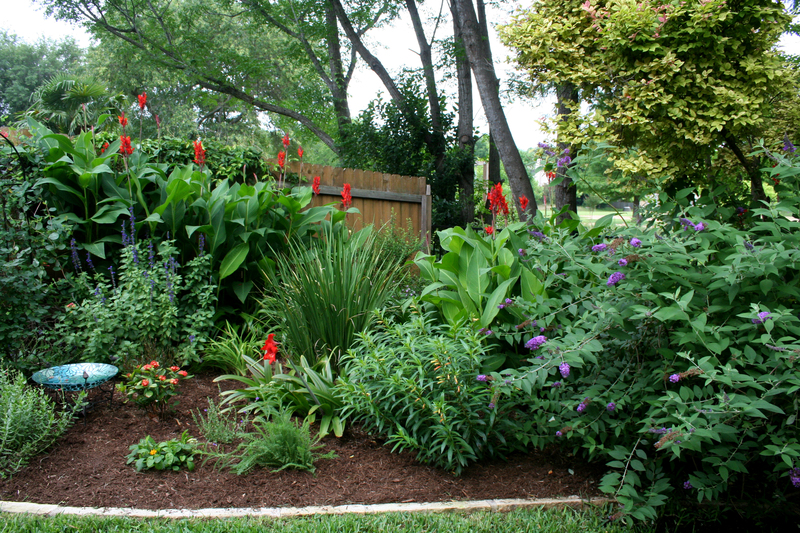 A one hundred dollar prize will be awarded to the yard voted best landscaped during the Wells Branch Garden Tour on May 18, 2019. You may nominate your yard for inclusion in the tour by sending photos of your landscaping with your name, physical address, email and phone number to glennoe@att.net by April 20, 2019. Nine yards will be selected to participate in the tour, with an emphasis on including yards new to the tour, and tour participants will vote to name one yard “Best Landscape of the Tour“. Make Plans NOW to Join the Silver Branchers! The Silver Branchers began in 1988 as a group of seniors interested in meeting for fun and fellowship. The current group has continued this tradition and would like to extend an invitation to any and everyone who might be interested in making new friends. Meetings are held Thursdays from 1- 3 PM at the Wells Branch Rec. Center, 3000 Shoreline Drive to visit and play games. We also have socials and take day trips to local places of interest from time-to-time (list below). Membership is free. There are no age requirements; everyone is welcome. Thursday, April 18 – Picnic in the K.F. Park Gazebo catered by Branch Bar B Que. We will meet at the gazebo at 1:00pm. Cost is $17. Cut off for registration and payment is April 5. Advanced collection of fees is done by cash or check with Glen 512-461-1665. No refunds after cut off date. This event may be rescheduled to a later date in case of inclement weather. Thursday, July 18 – Museum trio: Bullock (https://www.thestoryoftexas.com),Blanton Museum of Art (https://blantonmuseum.org/) and the Harry Ransom Center (http://www.hrc.utexas.edu/) are all in close proximity so you can choose which you wish to visit. Cut off for registration is July 11. We will leave the Rec. Center at 10:00am and return at 2:00pm (back at the Rec. Center by 2:30pm). 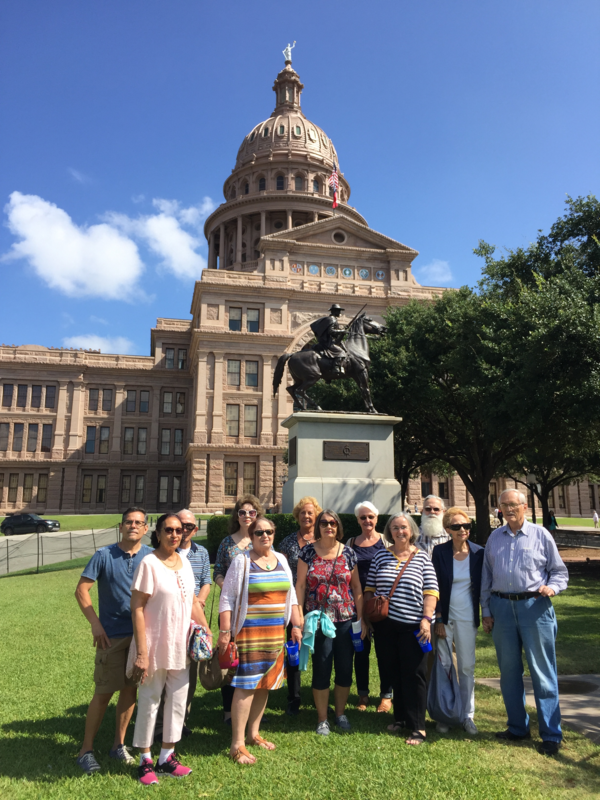 Wednesday, October 16 – Vanishing Texas River Cruise, 11:00am Cruise, http://www.vtrc.com/scenic-wilderness-cruises/. We will leave the Rec. Center at 9:15 and return following the cruise. Please make your reservation directly with the cruise operator (512) 756-6986 as early as possible after August 1 since these cruises sell out in advance. Cost is $22.50. Remember to sign up with the staff at the Rec. Center as well; that cut off date is October 10. Thursday, December 5 – Christmas Luncheon, 1pm at Mesa Rosa, 15515 FM 620, near the intersection with TX 45, http://www.mesarosa.com/. We will leave the Rec. Center at 12:30pm and return following lunch. Cut off for registration is November 27. You may sign up for events with the Wells Branch MUD’s customer service at 512-251-9814 or at the customer service desk at the Wells Branch Recreation Center. Please note that if we are not collecting fees in advance of an event, you will be responsible for making reservations if needed and paying any fees. Transportation may be limited, so please insure that you have secured a ride as we are not responsible for forfeited event fees. If private cars are used for transportation, you may be asked to contribute for the driver’s expenses. For more information call Glen at 512-461-1665 or http://wbna.us/community/silver-branchers/. and the Critters are BACK! Expect an increase in all kinds of wild creatures (possums, raccoons, snakes, rats, coyotes) this spring as we have several new construction projects underway in and around Willow Run. The best form of control for any of these animals is an integrated plan that removes access to shelter, food and water. If you have a rat or mouse problem, then the use of rodenticides or traps may be necessary as well. Every resident in Wells Branch can take steps to minimize appeal to these animals. Rodent control is particularly effective when all our neighbors participate. Do NOT leave food outside for your pets. If your animals eat outside, give them a chance to eat and then bring the food and water bowls inside. Secure all doggie-doors at night. If you have a bird or squirrel feeder, bring it in at night. Empty the birdbaths as well. Seal all openings into your home and any outdoor storage units using hardware cloth and steel wool. Mice can squeeze into a ¼” opening and it only takes ½” for a rat to gain access. Clean out any debris that might provide refuge for these animals. Coyotes: It’s breeding season, folks. Our largest den (by Sambuca and Mocha) has just been displaced and is in the process of relocating the pack within the area so we’re seeing increased activity. Please visit the sites listed below and make sure you’re following all their tips. Keep your pets inside from just before dusk until after dawn. If they have to go out, take them on a leash – even in your own yard. We have had coyotes both jump and dig under fences. Be aware of your surroundings at all times. They’ve been sited along the trails daily and have even followed walkers. Keep your dog on a leash and close by. Below are two presentations given by City of Austin Wildlife Animal Protection Officer Adrienne Clark in Wells Branch in 2018 & 2017, a hand out from Travis County to download, and links to City of Austin, Humane Society, and Texas Parks & Wildlife pages devoted to information on coyotes in an urban environment. 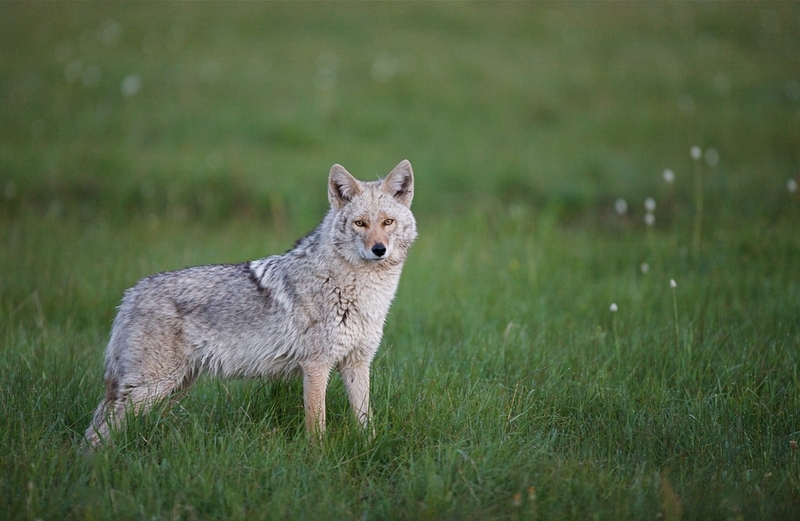 All cover tips on deterring coyotes and discuss how to best protect your fur babies. Living with Urban Coyotes in Austin/Travis County – What to do. Who to call. Should you come in contact with a coyote that does not respond to hazing or acts in an aggressive manner, please report it directly to Adrienne Clark. ***NOTE: Please don’t file a report unnecessarily as it will most likely be put down. They do not relocate coyotes. 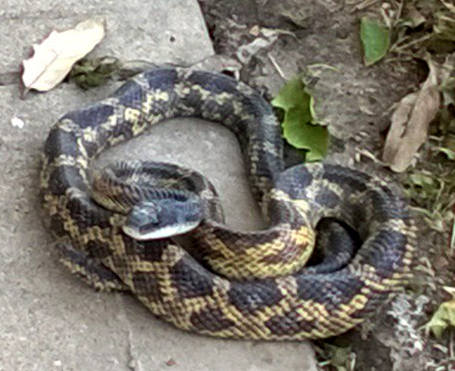 Snakes: With the mild winter we’ve had and a plentiful food source, our slithery friends are out and about! Please remember that rat snakes are our FRIENDS. They earn their keep around here by keeping the rodent population down. While they can get quite large, they don’t pose a threat to you, your children or your pets and are reluctant to bite unless messed with – leave them be and they’ll go on about their business. Unsure about which snakes are harmless and which may be poisonous? Visit austinreptileservice.net to learn more. This site makes it easy by breaking them down by stripes, blotches, diamonds, bands and solid color snakes. Come support the McNeil High School Band! Silent Auction & Performances from Student Ensembles! 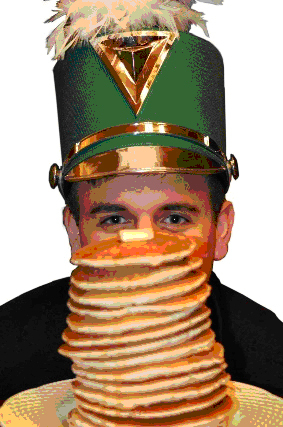 *You are also supporting our feeder Middle School Band programs! Tickets are $6 and are being sold by McNeil High School Band Students & Deerpark Middle School Band Students. They will also be available at the door. If you or your business would like to sponsor this event or donate to our silent auction, please contact us at fundraising@mcneilband.org, we have several levels of sponsorships available. Thank you for your support of our community and our band students.